The decorations in Stratta are not to be missed. 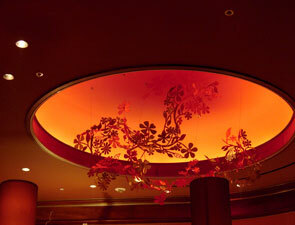 At the entryway, sunset-colored hues (red, orange, yellow) emanate from a large circular dome in the ceiling, and suspended from that dome is a whimsical, reddish floral structure. At the hostess station you'll see a large, red-hued, shaded lamp on top of a band of sand-colored branches. All of these touches add to the rustic feeling of the restaurant – it's more casual than formal and the deep red and sepia tones blend together well to make you feel like you're in your favorite neighborhood restaurant, where it's comfortable, yet elegant. In the more formal portion of the dining room you'll find both the demonstration kitchen and a wine cellar with a glass door and wooden frame. The presentation is backlit and beautiful, and adds that extra special touch to the room. Continuing with the color palette throughout the restaurant, the open kitchen has plenty of beautiful reds as well as a lot of stainless steel. The open kitchen is really more like a very large open cutout in the wall, with a view into the kitchen. One can't sit right at the opening, but it is fully visible from within the dining room. 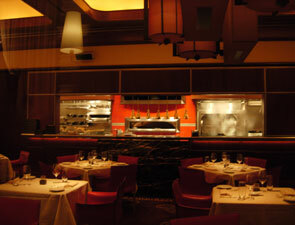 One of the most famous features of the restaurant is also inside the open kitchen – the pizza oven. Regulars and soon-to-be regulars alike know that Stratta's savory pizzas, with their delicate thin crusts, are prepared to perfection here each evening.